The Democrats ran on this. I'm unsure why any of you are surprised. (02-08-2019 01:21 AM)fsquid Wrote: The Democrats ran on this. I'm unsure why any of you are surprised. That wasn’t why they won more seats. That was actually one of the most unpopular planks in thier campaign. That said, I think it’s actually going to work in Trumps favor. The more extreme and political the crazy Dems look—the more Trump appears like the only guy working for the people. Just wait til tax season to be over. People will see exactly who drum-for was for and it wasn’t the people. (02-07-2019 09:54 PM)swagsurfer11 Wrote: Nothing to worry about if ya did nothing wrong. Squandering away tax payer dollars. Of course, as a liberal, you see nothing wrong with this. (02-07-2019 10:02 PM)swagsurfer11 Wrote: Mueller is only looking at Russia. Why should he be looking elsewhere? This is a snipe chase. If he finds other crimes in the process, he’s referred them to the proper authorities. How much did the deficit balloon under El Dumbo? Note that no significant reduction occurred until republicans retook the budget-writing house of representatives. This is despite claims that 1) the huge deficit increases were temporary and needed to fight the recession, and 2) the recession was over by 2010. So blaming the deficit on Trump when 80% of it or so is inherited from Obama is at best somewhat disingenuous. This is not to give republicans a pass. I've complained repeatedly about their reluctance to act more decisively when they took over the house in 2011. (02-07-2019 10:11 PM)shere khan Wrote: Reeeeeeeeeeer. Been there , done that, many times. (02-07-2019 11:02 PM)UofMstateU Wrote: The democrats in the house just got spanked today. They had asked Whitaker to come in Friday to testify. He agree that he would. Then the democrats told him he would have to be prepared to talk about things he and Trump had spoke about, but wouldnt tell him in advance what they were going to ask him. When the dems thought he might balk, they decided to start the subpoena process "just in case". Trey Gowdy told Whitaker that he should refuse to testify, let them subpoena him, challenge that subpoena to a judge next week, and by then, what ever the ruling from the judge, Barr will be the new AG and Whitaker can tell them to f*ck off. Today, Whitaker appears to be decding that he wont testify. Nothing you wrote is true. They gave him questions beforehand. Read it and weep. The democrats caved. After a heated back-and-forth, the chairman of the House Judiciary Committee, Jerrold Nadler, bowed to the wishes of the acting attorney general, Matthew G. Whitaker, that he not issue a subpoena while Mr. Whitaker testifies before the committee as scheduled on Friday. They did not give him the questions ahead of time, but simply tried to "assure him" (ie lie to him) that they would work with him on anything he didnt want to answer. In any event, the crooked democrats caved. Don't you get tired of repeatedly bashing him upside his head? Dems want to comb through personal finances of their political opponent with no credible, much less probable cause. Nothing to worry about? How are you holding up this tax season? (02-07-2019 10:12 PM)memphistiger89 Wrote: Squandering away tax payer dollars. Of course, as a liberal, you see nothing wrong with this. The huge early Obama deficits were from reduced revenue. Obama was blamed for 2009, even though the budget was from the previous year. Trump isn’t to blame for 2017 either. Now Republicans in the Congress are definitely to blame for the recent increased deficits. 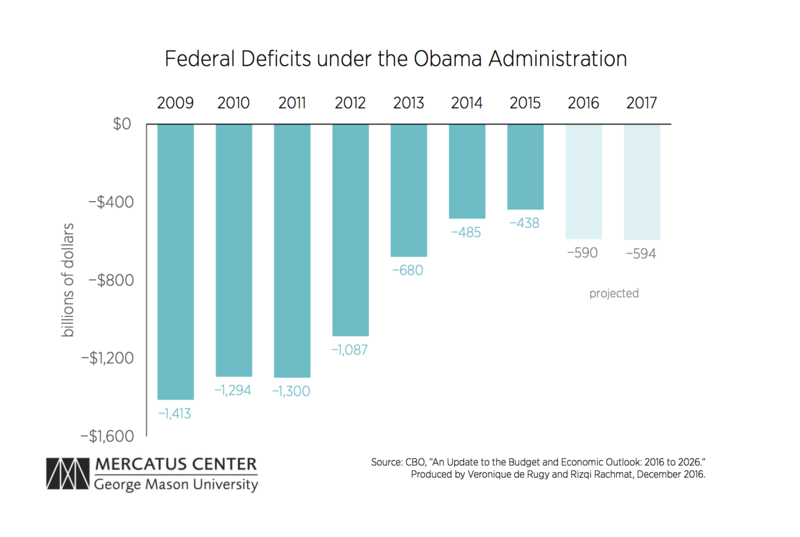 (02-08-2019 08:07 AM)swagsurfer11 Wrote: The huge early Obama deficits were from reduced revenue. Not exactly. Revenues decreased $400 billion from 2008 to 2009, but expenditures increased $600 billion, increasing the deficit from $400 billion in 2008 to $1.4 trillion in 2009. Revenues increased $50 billion in 2010, and expenditures decreased $50 billion, so the deficit was reduced to $1.3 trillion in 2010. Then both revenues and expenditures increased by $150 billion in 2011, so deficit remained about $1.3 trillion. So it was a good bit of both. Quote: Obama was blamed for 2009, even though the budget was from the previous year. Actually, no. The 2009 budget was signed by Obama and included significant jumps from the budget proposed by Bush. So yes Obama should get the blame. And as I've noted before, the attempt to blame the increase on the recession is somewhat contradicted by the fact that the deficits remained even after the recession was supposedly over. Quote: Trump isn’t to blame for 2017 either. Now Republicans in the Congress are definitely to blame for the recent increased deficits. Except that CBO forecasted most of the recent increases, and further increases in the future, based on Obama's policies, before Trump took office. Trump can be blamed for maybe 20% of the deficit, but the rest is on Obama, because he baked it into the cake before Trump got there. Actually, I will give credit to Obama and his team for political savvy. They managed to time everything so that the deficit hit its valley just as Obama was going out, giving him the opportunity to claim to have reduced the deficit, while creating the impression that his successor grew the deficit immediately. But Obama and his team were always masters of illusion. (02-08-2019 06:50 AM)swagsurfer11 Wrote: If he finds other crimes in the process, he’s referred them to the proper authorities.